Hiya guys! I was noticeably absent for Halloween. Didn't post about and special festive treats or recipes. Sorry about that. Life has been keeping me busy, and I didn't get into any creative food prepping for Halloween. Last Friday I finished my edits, and that gave me the weekend to decorate the house (I thought I posted photos once before, but looks like I haven't. I started some frenzied Halloween decorating before we even had children. Now there's no turning back, must decorate every year, and it's a big job!). Add on weekend activities and getting sorted again for Monday's Halloween happenings - yeah, making spider cupcakes or pumpkin cookies was just not on my radar. But, here's what is on my radar: Jerk Chickpeas! This is a new recipe from LTEV. I love this one. 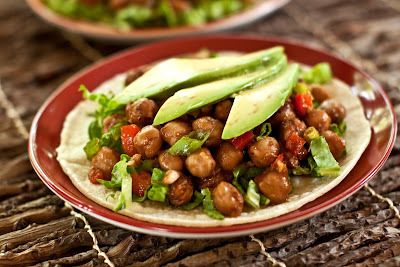 As I said in my last post, I love bean recipes, and this one is spicy and flavorful. I made them today for dinner tonight, and thought "enough, I can't keep back all the photos any longer!". So, here is Hannah's splendid photo of my Jerk Chickpeas. You can serve these chickpea on rice or quinoa, but I especially like to fold them in warm tortillas with slices of avocado, which is how we presented it here. The cool avocado offsets the spicy marinade so wonderfully. A little sneak peak for you. Hopefully you can wait another few months for the recipe - yes? I can wait because I have the book on pre-order so I know it's on its way someday soon.... But when you post the picture of the cover, then I probably will not be able to wait again! thanks Sarah and Anne, I mistakenly posted this to my recipes blog instead of this blog, so now I'm reposting and pasting in your comments! I like this recipe and the tamari one too for breakfast alongside some potatoes and sauteed veggies. I was refering to the tamari chickpeas from ED&BV. We try to do a "big" breakfast on the weekend. Typically it's toast, smoothie or oatmeal on weekdays. how could I forget those, I only make a triple batch every week?! Yeah, the girls could eat those tamari chickpeas morning, noon, and night! Where is your recipes page? I'd love to take a look at it. Thanks Dreena, we're following both of your blogs now, those recipes are so exciting and we'll be sure to get the new book.